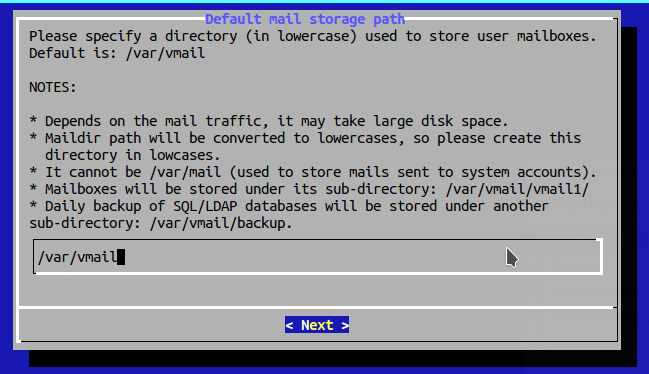 Setting up your own mail server from scratch on Linux is complex and tedious, until you meet iRedMail. This tutorial is going to show you how you can easily and quickly set up a full-fledged mail server on Ubuntu 16.04 with iRedMail under 30 minutes. Create as many virtual mailboxes as you want in a web-based admin panel. 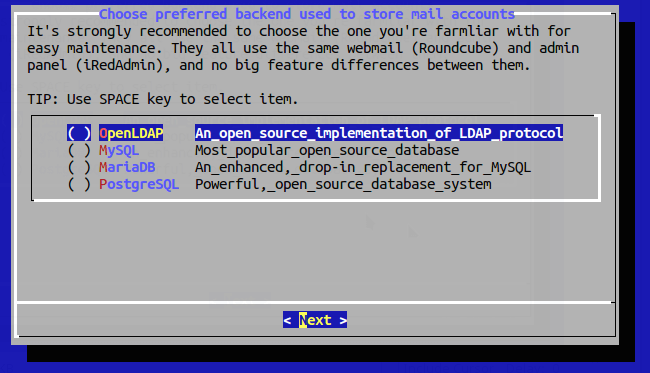 Stores mail accounts in OpenLDAP, MySQL/MariaDB, or PostgreSQL. It is recommended that you follow the instructions below on a clean install of Ubuntu 16.04 system that has at least 2GB of RAM, as after the installation your server will use more than 1GB of RAM. Don’t run this iRedMail server alongside your website or blog on the same machine, unless you are confident that you can restore the virtual host file for your website or blog, because the installation process will break your existing virtual hosts. If you need to do this on a VPS, then I recommend Linode, from which you can get a 2GB VPS for only 10 USD per month. I recommend Linode because it doesn’t block port 25. Other VPS providers like DigitalOcean blocks port 25 and you will need to set up SMTP relay, which can cost you additional money. First, make sure your server IP isn’t listed in any email blacklist. You can go to mxtoolbox.com and dnsbl.info to check your server IP address. If it’s in a blacklist, you can delete your VPS instance in Linode and create a new one. As Linode uses an hourly billing model, you won’t be charged by month, but by how many hours you used, which makes it convenient to delete a VPS instance. Once you have a server with good IP reputation, SSH into your Ubuntu 16.04 server and update all software. Then set a fully qualified domain name (FQDN) for your server with the following command. We also need to update /etc/hosts file. Save and close the file. To see the changes, re-login and use the following command to see your hostname. 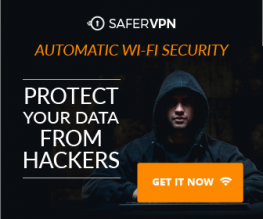 The A record points to your mail server’s IP address. If your server uses IPv6 address, be sure to add AAAA record. Next, download the iRedMail Bash installer with wget. At the time of writing, the latest version of iRedMail is 0.9.7, released on July 1, 2017. Please go to iRedMail download page (http://www.iredmail.org/download.html) to check out the latest version. Then cd into the newly created directory. Add executable permission to the iRedMail.sh script. Next, run the Bash script with sudo privilege. The ncurse-based setup wizard will appear. Select Yes. The next screen will ask you to select the mail storage path. You can use the default one /var/vmail. Next, choose your preferred web server: Apache or Nginx. You need to use up and down arrow and press the spacebar to select. Then select the storage backend. Choose one that you are familiar with. This tutorial chose MariaDB. 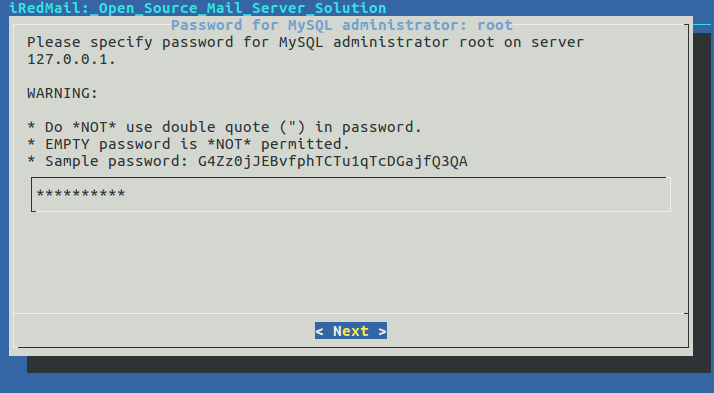 If you selected MariaDB or MySQL, then you will need to set the MySQL root password. you can run the following command to login, with sudo and without providing MariaDB root password. This is because MariaDB uses unix_socket authentication plugin, which allows users to use OS credentials to connect to MariaDB. But you still need to set root password in iRedMail setup wizard. Next, enter your first mail domain. You can add multiple mail domains later in the web-based admin panel. This tutorial assumes that you want an email account like [email protected], in that case, you need to enter your-domain.com here, without sub-domain. Do not press the space bar after your domain name. I think iRedMail will copy the space character along with your domain name, which can result in installation failure. 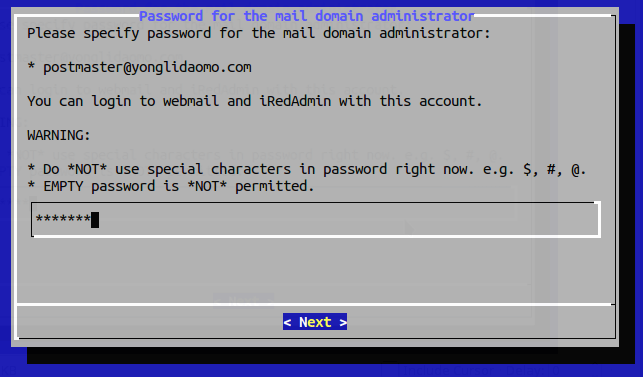 Next, set a password for the mail domain administrator. Now you can review your configurations. Type Y to begin the installation of all mail server components. At the end of installation, choose y to use firewall rules provided by iRedMail and restart firewall. Now iRedMail installation is complete. You will be notified the URL of webmail, SOGo groupware and web admin panel and the login credentials. The iRedMail.tips file contains important information about your iRedMail server. * Please reboot your system to enable all mail services. Reboot your Ubuntu 16.04 server. Once your server is back online, you can visit the web admin panel. Because it’s using a self-signed TLS certificate, so you need to add security exception. Login with the postmaster mail account. In the Add tab, you can add multiple domains or mail users. 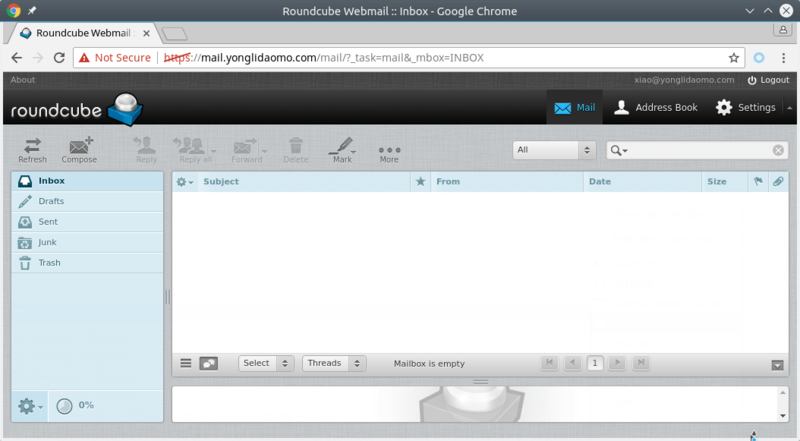 After you create a user, you can visit the Roundcube webmail address and login with the new mail user account. And test email sending and receiving. Please note that you may need to wait for a few minutes to receive emails because greylisting is enabled by default. You can change password and create filter in RoundCube. Update: If your hosting provider or ISP blocks port 25, then you can’t send emails directly. You can set up SMTP relay to solve this problem. The following message in /var/log/mail.log indicates port 25 is blocked. Since the mail server is using a self-signed TLS certificate, both desktop mail client users and webmail client users will see a warning. To fix this, we can obtain and install a free Let’s Encrypt TLS cert. First, install Let’s Encrypt (certbot) client on Ubuntu 16.04. The Apache and Nginx configuration directories are heavily modified by iRedMail, so here I recommend using the webroot plugin, instead of using apache or nginx plugin, to obtain certificate. Run the following command. Replace red text with your actual data. You will see the following text indicating that you have successfully obtained a TLS certificate. Your certificate and chain have been saved at /etc/letsencrypt/live/mail.your-domain.com/ directory. After obtaining a TLS certificate, let’s configure web server to use it. If you use Apache web server, then edit the default virtual host file. Add the following 3 lines above </VirtualHost>. The above 3 directives will redirect HTTP connection to HTTPS. The rewrite module needs to be enabled for them to work, which is achieved by executing the following command. Then edit the https version of the default virtual host. Find the following 2 lines. We need to replace the self-signed certificate with Let’s Encrypt issued certificate. So the above two lines need to be changed to the following. Save and close the file. Then reload Apache web server. 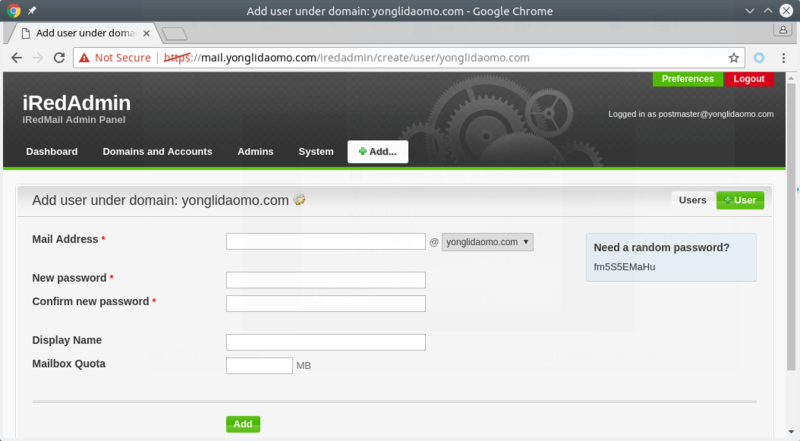 Now if you visit iRedMail admin panel or Roundcube webmail again, you shall see a green lock in the browser address bar. If you use Nginx, then edit the SSL template file. Save and close the file. Then test nginx configuration and reload. 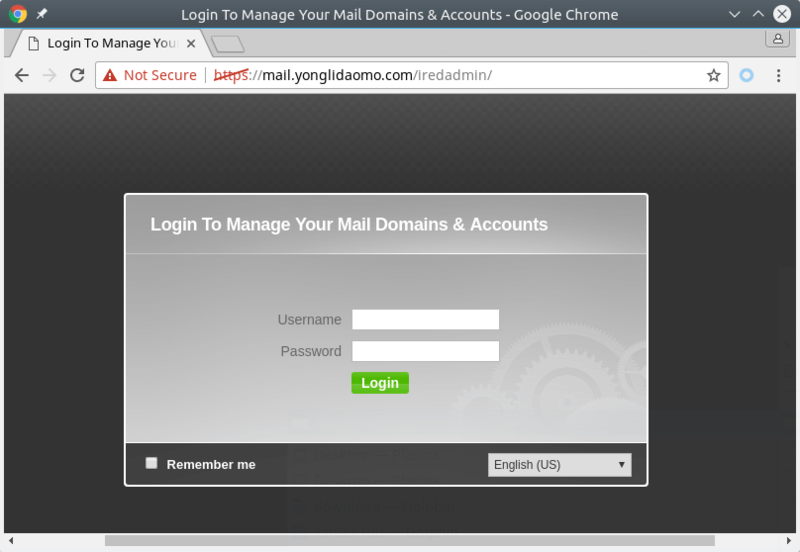 Visit iRedMail admin panel or Roundcube webmail again, you shall see a green lock in the browser address bar. We also need to configure Postfix and Dovecot to use the Let’s Encrypt issued certificate so that desktop mail client won’t display security warning. Edit the main configuration file of Postfix. Find the following 3 lines. (line 95, 96, 97). Next, edit the main configuration file of Dovecot. Save and close the file. Then reload dovecot. From now on, desktop mail users won’t see security warnings. To auto renew certificate, simply open root user’s crontab file. Then add the following line at the bottom of the file. If you use Nginx web server, then replace apache2 with nginx. Reloading is necessary to make these programs pick up the new certificate and private key. Fire up your desktop email client such as Mozilla Thunderbird and add a mail account. In the incoming server section, select IMAP protocol, enter mail.your-domain.com as the server name, choose port 993 and SSL/TLS. Choose normal password as the authentication method. In the outgoing section, select SMTP protocol, enter mail.your-domain.com as the server name, choose port 587 and STARTTLS. Choose normal password as the authentication method. To prevent your emails from being flagged as spam, you should set PTR, SPF, DKIM and DMARC records. A pointer record, or PTR record, maps an IP address to a FQDN. It’s the counterpart to the A record and is used for reverse DNS lookup. Reverse resolution of A record with PTR record can help with blocking spammers. Many MTAs accept email only if the server is really responsible for a certain domain. Because you get IP address from your hosting provider, not from your domain registrar, so you must set PTR record for your IP in the control panel of your hosting provider and its value should be your mail server’s hostname: mail.your-domain.com. If your server uses IPv6 address, be sure to add a PTR record for your IPv6 address. SPF (Sender Policy Framework) record specifies which hosts or IP address are allowed to send emails on behalf of a domain. You should allow only your own email server or your ISP’s server to send emails for your domain. 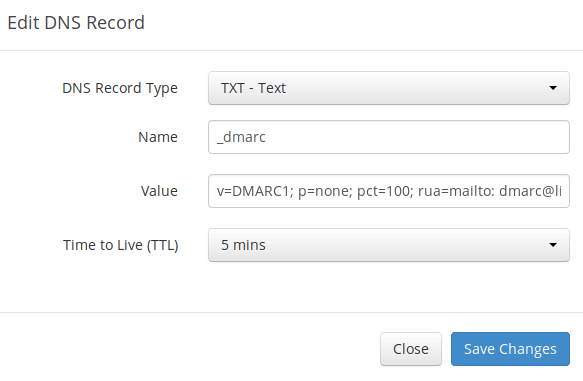 In your DNS management interface, create a new TXT record like below. TXT indicates this is a TXT record. Enter @ in the name field. v=spf1 indicates this is a SPF record and the SPF record version is SPF1. mx means all hosts listed in the MX records are allowed to send emails for your domain and all other hosts are disallowed. ~all indicates that emails from your domain should only come from hosts specified in the SPF record. Emails that are from other hosts will be flagged as forged. Note that some DNS managers require you to wrap the SPF record with quotes like below. TXT  @   "v=spf1 mx ~all"
The txt option tells dig that we only want to query TXT records. DKIM (DomainKeys Identified Mail) use a private key to add a signature to emails sent from your domain. Receiving SMTP servers verify the signature using the public key published in your DNS manager. 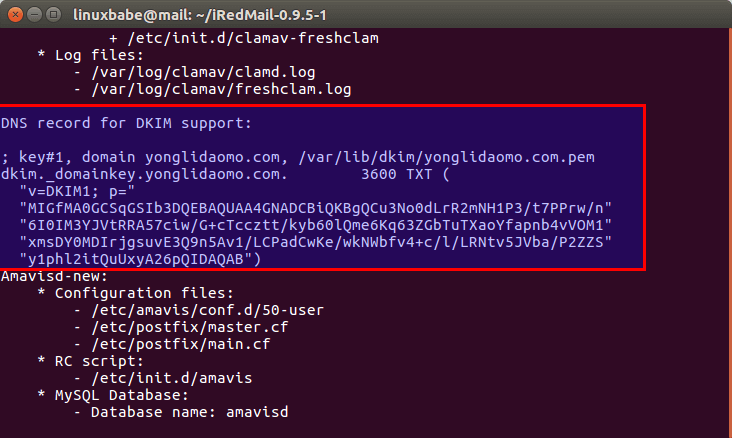 The iRedMail script automatically configured DKIM for your server. The only thing left to do is creating DKIM record in DNS manager. 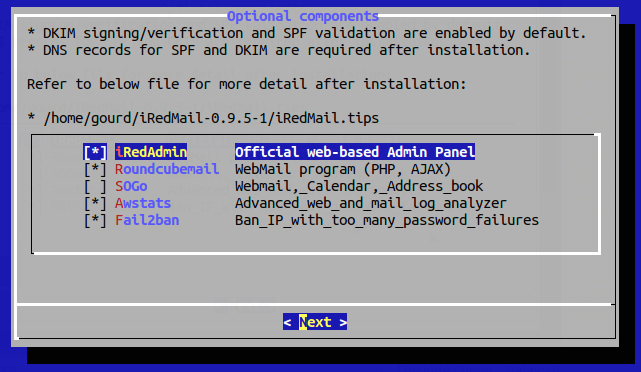 Open the iRedMail.tips file under iRedMail-0.9.7 directory. Scroll down to DNS record for DKIM support section. The DKIM public key is in the parentheses. You can also show the public key with the following command. Then in your DNS manager, create a TXT record, enter dkim._domainkey in the name field. Copy everything in the parentheses and paste into the value field. Delete all double quotes and white spaces. After saving your changes, run the following command to test if your DKIM record is correct. If the DKIM record is correct, the test will pass. Note that your DNS record may need sometime to propagate to the Internet. DMARC stands for Domain-based Message Authentication, Reporting and Conformance. DMARC can help receiving email servers to identify legitimate emails and prevent your domain name from being used by email spoofing. The above DMARC record is a safe starting point. To see the full explanation of DMARC, please check the following article. After creating PTR, SPF, DKIM record, go to https://www.mail-tester.com. You will see a unique email address. 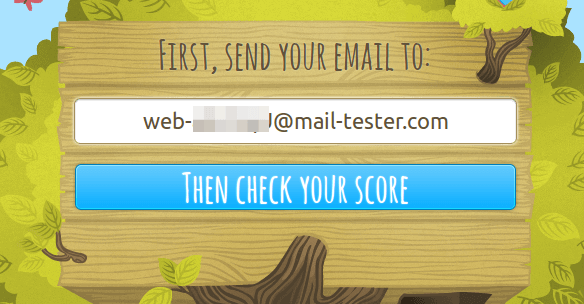 Send an email from your domain to this address and then check your score. Mail-tester.com can only show you a sender score. 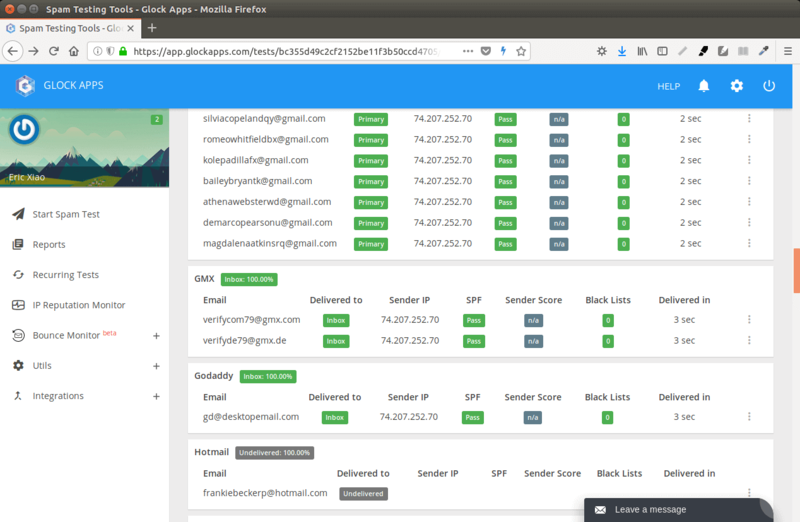 There’s another service called GlockApps that allow you to check if your email is placed in the recipient’s inbox or spam folder, or rejected outright. It supports many popular email providers like Gmail, Outlook, Hotmail, YahooMail, iCloud mail, etc. I wrote this article to show you how to add multiple mail domains in iRedMail. If you are going to use Microsoft Outlook client, then you need to enable SMTPS port 465 in Postfix SMTP server. Your primary mail server could be down sometimes. If you host your mail server in a data center, then the downtime is very minimal, so you shouldn’t be worried about losing inbound emails. If you host your mail server at home, the downtime can’t be predicted so it’s a good practice for you to run a backup mail server in a data center to prevent losing inbound emails. The backup mail server needs just 512MB RAM to run. Please check the full detail in the following article. That’s it! I hope this tutorial helped you set up a mail server with iRedMail on Ubuntu 16.04. Subscribe to our free newsletter to get latest Linux tutorials. You can also follow us on Google+, Twitter or like our Facebook page. Awesome post! Thanks Xiao Guoan! A setup like this has been long overdue – I’m planning to switch over. Thank you very much Xiao Guoan! Ok. I found iRedMail.tips in the mail. Working on dkim now. Hello and thanks for this great tutorial. Everything goes well but when i try to log in to iredadmin the server return error 404 not found. Please add more details to your situation, like what web server you use (Apache or Nginx). If possible, upload a screenshot and check your web server error log. Will this overwrite existing mysql databases and settings? Is it possible to skip the mysql section if it is already installed and functional? I think it will create new database but not overwrite your existing database. You can backup your existing database before installing iRedMail to be on the safe side. Ok – I’ll do good backups before installing. Thanks. This broke my other ssl enabled sites. Don’t recommend using this on any webserver. You should read prerequisites before trying to discredit someone’s work. I am not using any hosting service. The mail server is created in the lab. My os is ubuntu 16.04. How to achieve PTR stuff. When I restarted Apache it came up with this error: syntax error on line 29 of /etc/apache2/sites-enabled/000-default.conf: invalid command ‘rewriteengine’, perhaps misspelled or defined by a module no action ‘configtest’ failed. I remmed out those 3 lines and everything seems to be working fine, is there something I did wrong and is there something I need to do to fix this. Thanks for the guide i installed it perfectly. got 10/10 out of mailtester. Next step is connection with ldap / ms ad or samba4. I tried to follow https://docs.iredmail.org/active.directory.html but got stuck at dovecot. and finding config files for rouncube (ngnix other place ?) and missing guide for sogo. do you have any plans to make a guide for that ? Hi, I’m wondering why I have to set my hostname to `mail.my-domain.com` instead of `my-domain.com` as it was previously. I’m not an expert, but since this is the same server I host a HTTP server on, won’t setting the hostname to `mail.my-domain.com` make it so people have to access my website using `mail.my-domain.com`? This hostname will be used by your mail server. It has nothing to do with website address. 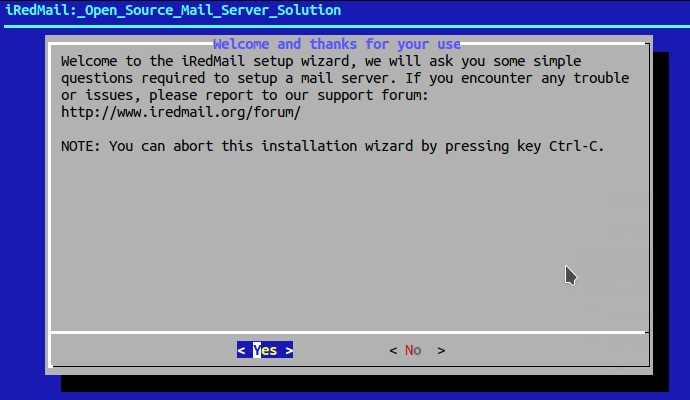 Please note that iRedMail will change the web server configuration directory. Your website may stop working. You can bring it up with a little work, but I recommend that you back up web server configurations. Yes, it’s system-wide, but almost always your Apache virtual host or Nginx server block is configured to use a different value. The Bash shell by default only shows the leftmost part of your hostname. Hi, I’m curious. The guide was fantastic! But since you have a lot of experience doing this, how much would you charge to set it up? It would be a linode and have domain name already. Very curious but extremely serious and will pay. Hi, it will be a fixed price of 35 USD. If interested, contact me via email. My email address can be found on the “Contact Us” page. Xiao, thank you so much for your process here. I had a couple hiccups but in the end got the mail server running. Wonderful write-up, plenty of great information. Hi, I cant get past this please help. Package zoo is not available, but is referred to by another package. Package php-mcrypt is not available, but is referred to by another package. <> Installation failed, please check the terminal output. Can this be done on an 18.04 installation as well? Yes, Ubuntu 18.04 is supported by iRedMail. Greylisting will delay receiving email from unknown senders. i followed these steps now i can send the emails but when i am sending mails from gmail to this server mails are not coming in inbox. i created a @ mx record pointing to mail.mydomain.tld . Please help. Hi, greylisting will delay incoming email for a few minutes. You can check your mail log with sudo nano /var/log/mail.log. If you see a mail address is greylisted, the emails will be delayed. Also make sure you create an A record for mail.yourdomain.tld. Is it possible to create mx record without creating a record?? Obviously i created a A record mail.domain.tld. And delay after 6 hours i have not received any mail. How long?? If you created MX and A record correctly, then Gmail can find your mail server. Greylisting will delay emails no more than 15 minutes. Can you paste your mail log in the comments? Also can you tell me your domain just to make sure I can verify your MX and A records? Hello, how can I take off redirect to /mail when browsing my-domain.com? I want it to redirect to my website. Hi, looks like you didn’t follow this tutorial exactly as I told. You need to find your virtual host configuration file for your-domain.com and replace it with the original one. I am using nginx, I did every step. Following this tutorial, you should be able to access your webmail from mail.your-domain.com. If you installed iRedmail alongside your website on the same machine, which broke your website, you should create a virtual host file for your website in /etc/nginx/sites-enabled directory, then reload Nginx. That will restore your website. I have the same problem as Zard with zoo and mcrypt. Insatlling on Ubuntu 18.04 LTS. Any pointers are greatly appreciated. I followed this tutorial on out DigitalOcean Ubuntu 16.04 LTS server using the Nginx web server and OpenLDAP account storage. Everything seems to be working fine except for the sending of email, even from one internal email to another on our own system. My spam result tests show that our DigitalOcean droplet has a blacklisted IP in two cases. That would easily explain why our email isn’t hitting external inboxes. I tried sending to my personal gmail and AOL accounts and both received nothing. This is the error I receive from the Mailer Daemon trying to send to my AOL address. Sending to either the internal email or my personal gmail yields nothing. Its clear that the server is sending something out when I try to email my AOL address but it is still being refused, and I cannot send anything internally either. I’m not sure what I’m missing and any help is appreciated. Seems the issue was on DigitalOcean’s side, nevermind 🙂 Great tutorial. Hi! Great tutorial, everything looks great, except for one thing: I cannot send mails. Receiving is fine, I’ve done many tests, but I can’t send anything. On the mail.log file, the problem appears to be “connection timed out” and after a little digging, I found that some ISP are blocking SMTP port 25 for outbound traffic. I tried tweaking the postfix configuration files, but no luck. Any suggestions? What is the best method to encrypt emails at rest on your server. Has anybody tried this, for example? The guide worked perfectly to me, until the section: Using Separate Domain for RoundCube. It seems to my like some changes have been made from iRedMail-0.9.7 to iRedMail-0.9.8 in the Nginx configuration. At least the /etc/nginx/sites-conf.d/default/ are not to be found on my setup. Any ideas for getting the new certificate right for a second (and third) domain? – Thanks! Thank you very much for this tutorial! I have successfully setup my self-hosted mail server using your instructions. They were clear and the screen shots were very helpful. Thank you for the Spam Tester website, it helped me troubleshoot that i needed another TXT entry for DKIM. I am behind Comcast internet, last thing i need to do is call Comcast up to update their Reverse DNS to my domain. I tried to install iRedMail 0.9.8 on Amazon EC2 with OpsWorks Stack on Ubuntu 16.04. During the installation it shows the message that the user “iredadmin” isn’t available. Checking locks an running services shows that uwsgi service isn’t running. I tried to add the default ubuntu source.list but it does not solve this problem. Did anyone have an idea? [ INFO ] Create self-signed SSL certification files (2048 bits). [ INFO ] Generate Diffie Hellman Group with openssl, please wait. [ INFO ] Create required system account: vmail, iredadmin, iredapd. [ INFO ] Configure Apache web server. [ INFO ] Configure PHP. [ INFO ] Configure Postfix (MTA). [ INFO ] Configure Dovecot (POP3/IMAP/Managesieve/LMTP/LDA). [ INFO ] Configure Fail2ban (authentication failure monitor). [ INFO ] Configure Awstats (logfile analyzer for mail and web server). Check /etc/passwd file to see if iredadmin is there. thanks a lot, I added the user before installation. As I told you before, simply fantastic. I have a little trouble with outgoing messages from AWS. AWS told me “congratulations already you don’t have any limitation to send emails”, however, after 10 days, when I send emails still going to SPAM. In your experience, what can be the solution? From the email headers, I can see there’s no SPF set for your domain and DKIM failed. There’s no DKIM public key of your domain. It is not sending emails to godaddy mails also not receiving. Please check the mail log /var/log/mail.log. Godaddy’s mail server (secureserver.net) can’t find the PTR record of your IP address. Create A PTR record for 45.64.11.2. I don’t understand why it needs to install a web server? I just want email. Is this for configuration purposes? Why can’t I just do that via SSH and text configuration files? The web server is needed to set up a webmail client, so you can access email in your web browser. If you don’t need that, you can disable the web server from running on your machine. This article did not say you can’t use SSH to install iRedMail on another machine. I was looking at the screenshot of the install questions. It gave you a choice of which web server you want (nginx or Apache) but did not appear to offer the option of skipping the webserver all together. iRedMail also comes with a web-based control panel that allows you to easily add email accounts, that also requires a web server. You may need this if you are not familiar with adding email accounts from the command line. You can disable or remove the web server after your email server is up and running, if you really don’t like having a web server on your machine. I notice there is a step where you set a static IP address of the mail server. This is problematic. I was planning on running my server with a dynamic DNS service and not using IP addresses at all. Is this not possible? With a dynamic IP address, you can’t set the PTR record, in which case you emails are more likely to land in spam folder or be rejected outright. If you plan to set up an email server in your home, ask your ISP if they can give you a static IP and if PTR record can be configured for your IP address. I think there’s another way around this: using a smart host (aka SMTP relay) to send email, but I haven’t tried that yet. Your hosting provider or ISP is blocking port 25. Ask them to open it for you. Can i change the smtp port from 25 to some other? 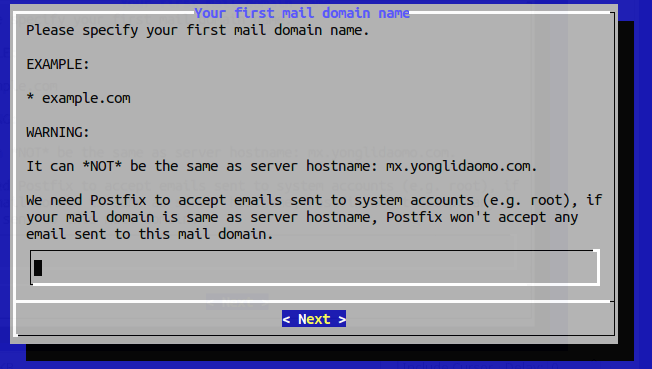 I’m afraid you can’t change what port Postfix uses to send outgoing email. Port 25 is required by the SMTP protocol. Yes, you can write PHP code to send email through your email server, although I’m not familiar with PHP programming. Actually I am using Azure VM, and azure doesn’t allow for port 25. they are recommending some other port like port 587 or 443. So if it is possible to change port for postfix smtp, please guide. some time send mails to godaddy some time not. You should ask your ISP to unblock port 25 or set up SMTP relay. Recipient address rejected: Intentional policy rejection, please try again later. This indicates that your server has enabled greylisting. The sending server will try again in a few minutes and it will be accepted. Graylisting is managed by iRedAPD. To disable graylisting, edit the configuration file. Remove "greylisting" from the list. Save and close the file. Then restart iredapd. You may need to add write permission before editing the file. HI, I’ve done everything with success but I can’t instatll certbot. I’m using debian 9. I follow the steps from certbot page but it wants to certificate my domain, I only have access to mail server. How can I do that? Make sure you have set A record for the hostname of your mail server (mail.your-domain.com), follow the certbot instructions and you would fine. Ho to use separate domain for SOGo mail client in apache2? Xiao thanks for the answer. For dkim, I generate the public and private key and configure my dns server. Where I should copy my private key. I must install something in my email server? My dns server is another server. iRedmail already installed necessary software for you, so no need to install other software. From your configuration, is there a way to change outgoing email port from 25 to 587 ? Actually i have installed the iredmail on the digital ocean droplet. My email server can accept inbound email but deferred all outgoing emails because DO is blocked port 25. I have asked them to open, but they cannot do it due to their policy. So, i’m searching if there is a solution for this problem and how to apply it to the iredmail configuration. Thanks for the answer xiao ! I have what I think to be a running server, with port 25 and 143 open. However, while testing my new email address (brand-new domain) I get Cannot connect to server or no response from server. I have port 25 and 143 open at the router and the internet. Do I need something besides postfix and dovecot running? Right now my PTR record points at another domain which I own – but that should not prevent me from connecting, right? It’s because either firewall is preventing access, or port forwarding is not working. PTR record is irrelevant in this issue. The danger of following a tutorial like this that you are installing a whole bunch of packages (do you understand what they all do?) which need to be configured accurately and kept up to date for ever. It is true that it is supposed to be done on a clean install, and it will PROBABLY work, but if it doesn’t you will have to do another clean install. There is no “uninstall/unconfigure”. It worked OK for me on my first go, but in setting up a standby server, it failed and couldn’t be unscrambled. Beware. ...in setting up a standby server, it failed and couldn’t be unscrambled. Is a fresh OS install on the standby server out of the question? Why not just try it again? Could you let me know the error when setting up a standby server? Thanks Xiao! I got those ports open (had a certificate path wrong). Nov 6 16:00:27 mail systemd-resolved: Server returned error NXDOMAIN, mitigating potential DNS violation DVE-2018-0001, retrying transaction with reduced feature level UDP. and maybe tell me what I might look at that could be the problem? I can send other logs too if needed. When connecting from my phone I get security error has occurred. Please check the mail log (/var/log/mail.log). Emails are not delivered to the dovecot IMAP server. Run the following command to check the status of dovecot. You should use the IMAPS port 993, instead of 143. Plain text IMAP is disallowed. Do I need to set this on the server, or just use port 993 at the client? If the server, how do I set it? Thank you for all of your responses – much appreciated! I wonder if I have got something in the infrastructure causing problems. Configure port forwarding in your router for port 993.
mail.your-domain.com is the hostname of your mail server. You also need to configure port forwarding for the submission port (587). This will have to wait a few days – stupid router will not register forwarding any more. DOH! I am able to send mail from this server, just not receive. I had to make it so TB saved messages in Local Folder. Do you think I have a permissions problem on the server? It doesn’t look like my mail boxes ae being created on the server? drwxrw-rw- 3 vmail vmail 4096 Oct 29 13:44 .
drwxrw-rw- 3 vmail vmail 4096 Oct 29 13:44 ..
drwxr-xr-x 8 vmail vmail 4096 Oct 29 13:04 .
drwxrwsr-x 3 root  mail  4096 Oct 24 11:54 ..
Are mailboxes supposed to be created here? Again, Thanks for any help you can provide! Mailboxes are created at /var/vmail/vmail1/mydomain.com. From your previous mail.log, I saw Dovecot didn’t deliver the email. Please check /var/log/dovecot/dovecot.log and /var/log/dovecot/lda.log. from the below, I can see that I have set the g/uid wrong? How, what steps do I take to (re)set the guid? and on what files? Check which user has ID 2000 and ID 5000.
so should I edit /etc/passwd? Please check /etc/dovecot/dovecot.conf file and find the following 4 parameters. If the values are set to 2000, then change them to 5000. After that, restart Dovecot. The settings surely were off – reset all to 5000 and success! Can I reward you in any way? Richard, no, re-installing the OS is not out of the question, but its a whole heap more work if its doesn’t install and configure properly first time. Xiao, I don’t remember the error exactly – some server was unreachable at the time, I think. My point was, it’s great when it works, and a lot of extra work when it doesn’t. Testing with mail-tester.com is essential to get all the things right. Citadel-suite has a mail server, chat server and other features and is generally easier. Your mail server WILL be attacked on the first day and every day. Hello Dear , thanks for this great tutorial. can I use it for local communication purpose only, (local mail) without connecting to the internet and without having dns?? Do you mean setting up email server for local network only? or local host only? Really apprecite you taking time to set this tutorial up. I’m getting this error when I’m trying to set up the certbort any idea on what I can do? I've set up the MX and A record to point to the correct FQDN and IP address. Looking at the mail.boltcorp.com webpage, It seems iRedMail isn’t installed yet. One more thing what email address do I put here? You can use any email address you have. Xiao – This guide is excellent. I followed your steps and everything is working perfectly. Before editing a file, copy it to a new file. If you make a mistake, then restore the original file. If you are using a server hosting service, they should provide a snapshot function. If you are using your own hardware at home, you can use clonezilla to take an image of your entire disk. One of the best intructions I have ever seen. Thank you so much for you time and patience. You have saved my day thank you! The iRedMail.tips file is under a directory. are you in the installation directory for iRedMail? I am having an issue with RoundCube. I posted this on the iredmail page as well but I thought I would hit you up on it too. maybe the following will be helpful? Check if Dovecot is running. And check if it’s listening on port 143. I know dovecot is running. Thanks for this other command – I will check in the morning (U.S.) Thank you! I got no output from that command. I assume dovecot is not listening on 143? any ideas on where to change 143 to 993? Or what I need to do? Is there a major difference between Xenial and Beaver in setting up iRedMail? No major differences. Just wanted to write a separate article for 18.04 and to hopefully find some bugs in the process. Perhaps a bug is one that port is set to 0 instead of 143 in /etc/dovecot/dovecot.conf? This is kind of in reply to the below question, too. Great, but I’m curious why your port was set to 0. The default should have been 143 after iRedMail installation. Min are set as the below info so do I need to uncomment some parts? # waiting for new connections. Perhaps. I found that if I press the space bar after the domain name entered in the set up wizard, the space character is copied along with the domain name and it will make the installation fail. That’s a bug I found when setting it up on Ubuntu 18.04. Hey i have no idea why but when i check for my DKIM i cannot see it anywhere on mxtoolbox.com and mail-tester.com, like it is not found. Do you think i have typed it right in my DNS record? It won’t appear on mxtoolbox etc. Run the following command to test if your DKIM record is correct. If the DKIM record is correct, the test will pass. I get Internal server error from iredadmin pages. I don’t think apt update caused the iredadmin error. You should check the Nginx logs in /var/log/nginx/ to find out the source of error. 192.168.0.23 - - [07/Dec/2018:07:58:23 -0700] "GET /mail/skins/larry/images/watermark.jpg HTTP/1.1" 304 0 "https://mail.email.com/mail/?_task=login&_err=session" "Mozilla/5.0 (X11; Linux x86_64) AppleWebKit/537.36 (KHTML, like Gecko) Chrome/70.0.3538.110 Safari/537.36"
192.168.0.23 - - [07/Dec/2018:08:00:06 -0700] "GET /iredadmin HTTP/1.1" 500 32 "-" "Mozilla/5.0 (X11; Linux x86_64) AppleWebKit/537.36 (KHTML, like Gecko) Chrome/70.0.3538.110 Safari/537.36"
If I reinstall iRedMail, will it overwrite the mysql installation? dr-xr-xr-x 10 iredadmin iredadmin  4096 Nov  5 11:19 .
drwxr-xr-x  4 root      root       4096 Nov  8 14:11 ..
is not there. Could this be causing the ISE 500 error? You should ask the software author. I just found a way to reinstall iRedAdmin alone – and this worked for me. Any good guide to install reverse DNS? You can change reverse DNS in the control panel of your hosting provider or ISP. Any idea how to change it so the reverse DNS will match? You can send an email to me, so that I can examine your situation. My email address can be found on the contact page. No DKIM found with the selector mail. Your DKIM subdomain is dkim._domainkey.yogavoga.com. The selector is dkim, the first 4 letters. Your DKIM record is correct. Send an email to me with whatever text in the email body. Then I can see why your message is from ns1.yogavoga.com. Can you show the mail-tester.com result so I can see what’s wrong? “DomainKeys Identified Mail (DKIM) is a method for associating a domain name to an email message, thereby allowing a person, role, or organization to claim some responsibility for the message. We were not able to retrieve your public key. Please ensure that you inserted your DKIM TXT DNS record on your domain yogavoga.com using the selector mail. Please run the following command on your email server to see what selector is being used for your domain. I saw in my mail log that you are using the ns1.yogavoga.com as hostname. Considering that the reverse DNS is set to box.yogavoga.com, you should use box.yogavoga.com as the hostname. To change the Postfix hostname parameter, edit /etc/postfix/main.cf file. Change it’s value to box.yogavoga.com. Save and close the file. Then restart Postfix. The default DKIM selector is dkim, and your DKIM record is correct, but for some reason your email server is using mail as selector. Open the Amavis configuration file. The second parameter in the parentheses is the selector used by Amavis. If it’s set to mail in your file, change it to dkim. Save and close the file. Then restart Amavis. You need to send a remove request to spamhaus. Ok i have submitted a request, so that’s the reason it cannot idetify the DKIM? Is there is any other solution? Please send an email to me so that I can check your DKIM signature. I temporarily disabled spamhaus check on my email server. I received your email. The selector used by your email is mail. Currently I don’t know what caused this problem. Maybe you can just create another DKIM record for mail._domainkey.yogavoga.com using the same public key. Your email server configuration looks good. Just be natural when writing email. Just wanted to write a quick “thank you” for the iRedmail write-up and website in general. Your walkthroughs are, by far, the best I’ve found on the net and you are my favorite linux educator. Thank you! I installed but it installed nginx web server, I have only ever used apache so would it be relatively simple to replace the web server with apache. ie add a mail.mydomain.com virtual host with ssl etc and just close down nginx? or are there deeper settings. I’m not much of a developer though. Also is it quite secure using default setup? I noticed that there are no ports open in firewall apart from web server and ssh. Would I have to open ports to connect to the smtp server from my websites? 995 or 465? But thanks for the great tutorial. Thank you, I found it almost immediately. Iv’e installed and apart from a few small issues I have to solve everything seems to be working fine. Thanks for the great tutotial. The sender’s IP address is blocked by zen.spamhaus.org. The sender should ask spamhaus.org to remove this IP address from the blacklist. I noted there was no option to install Apache – not a huge deal but I have much more experience with Apache than nginx. The real problem is that once install is complete I cannot connect via Cloudflare to mail.trecem.com – too many redirects . If i wipe iRedMail and install Apache, I can connect OK to https URLs however. Previously we had a test install of 0.9.7 running using Apache IIRC and it worked OK aside from some letsencrypt issues. Decided to go for a full install of the latest version and now I am stuck – Any clues? iRedMail does not include Apache web server since version 0.9.8. Cloudflare can’t proxy SMTP traffic. If you want to put the webmail behind Cloudflare, I suggest using a different subdomain for the webmail. You can see more details on this Cloudflare support page. doesnt work. ive tried every single guide online and nothing works. i cant access the server via the hostname. its a pain! wasted so much of my life away the past month trying to get it to work! What do you mean by “can’t access the server via the hostname”? You can’t log in to the server via SSH? Which steps have been successful for you and at which step you are stuck? How to set mx record on ubuntu 18.10 ?? MX record is a type of DNS record. You need to set DNS record on your domain registrar’s website.